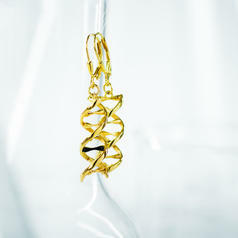 Geeky sieraad voor jouw nek gemaakt van zilver. We proudly present our Geek Gems. 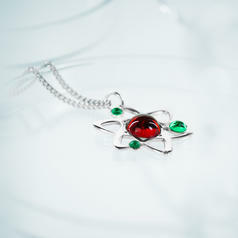 Finally, us geeks don't need to build our own jewellery from old electronic parts anymore, or wait for a snowflake from the North Pole! 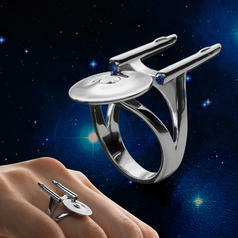 We're not sure who will be happier about this: geek girls looking for some classy jewels, or geek dudes who have to suffer every year searching for nerdy gifts in a mainstream world. 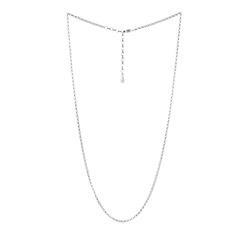 There're still the usual decisions to make, as we offer a selection. 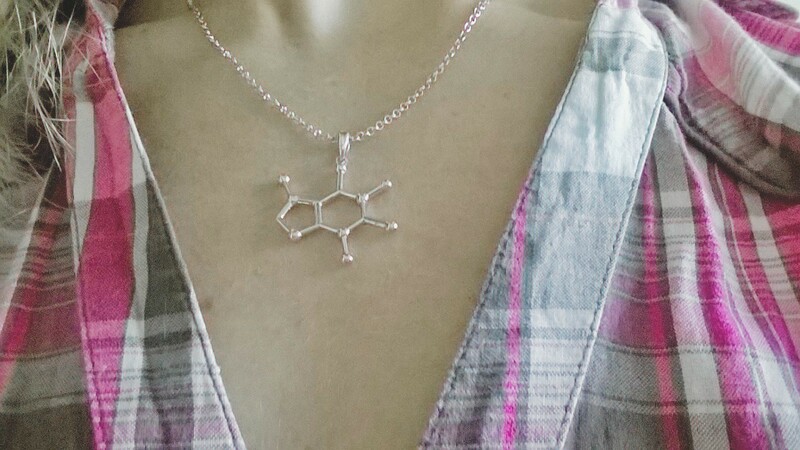 Our Molecule Necklaces are 46 cm long. There are 4 designs for every type of nerd: for the bright, the sleepy, for the people who need some energy and some extra happiness. 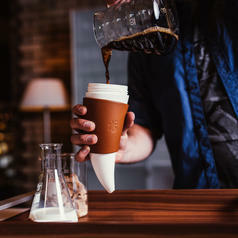 Of course the best molecule ever is available: Caffeine  yeah! Where would we all be without it? Stuck on 'level one' of life, that's where! 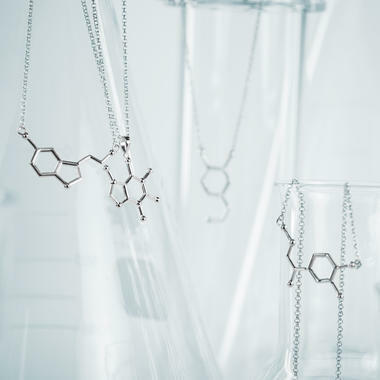 Some people claim it's not caffeine but adrenaline that gets them going, so check out the Adrenaline necklace. But if it's calm you need, rather than action, then there's Serotonin too. 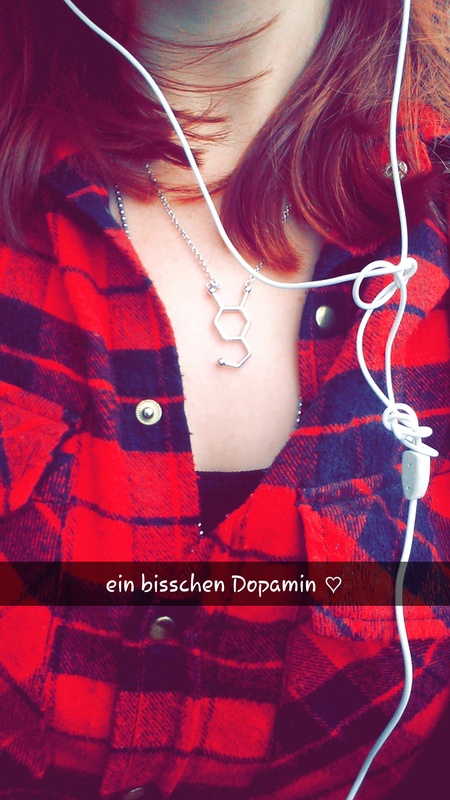 And if you just need some happiness and motivation Dopamine peps you up. 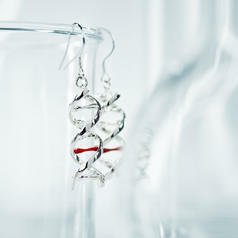 If you're more into biology or earrings in general, have a look at our DNA Earrings. aanbevolen leeftijd: Niet geschikt voor kinderen onder 3 jaar. Bevat kleine deeltjes. 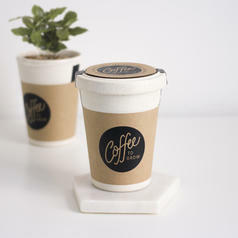 vanaf 1,45 € lade... Geek Pin Caffeine I can hear colours! 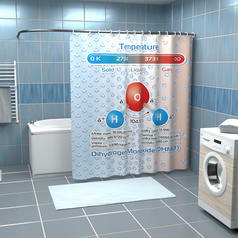 22,95 € lade... Shower Curtain Dihydrogen Monoxide This curtain allows you to learn things while taking a shower! 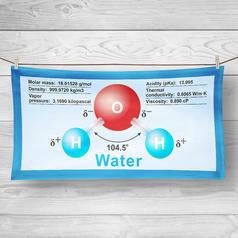 24,95 € lade... Dihydrogen Monoxide Beach and Bath Towel The wonderful world of water  only on this towel! 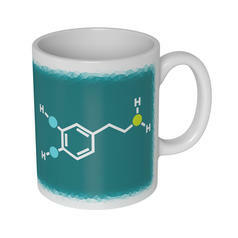 9,95 € lade... Dopamin Molecule Mug This mug is guaranteed to make you happy (baby)! 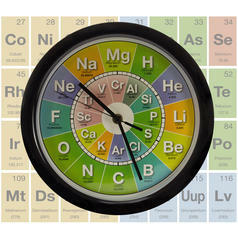 22,95 € lade... Scheikunde Klok Een speciale muurklok die de tijd laat zien met een atomisch nummer.